While waiting in the queue to get a coffee I overheard a young man regaling the story of how his aunt had fallen off the side of a mountain and died on impact. Not any old mountain, mind you. It was Snowdon, the highest in the UK. Hearing this made me feel sad. But then the chap perked up and said that she was 82, very fit and she died doing the thing she loved doing most, hiking. He then asked the lady serving him whether it was better to go quickly doing something you love or hang around and die in hospital of a slow and painful death. The woman looked at him sagely and said “oh yes, much better to go just like that, especially doing something you love… and not having all those tubes hanging out of you in hospital for weeks or months on end dying a slow and painful death.” To which he replied, “Yeah, she had a good life and she had lived to a ripe old age.” And on they continued, restating the virtue of a good death to somehow make them feel better about his sudden loss. You could see he was quite shaken by the news and wanted to rationalize the terrible accident. Slipping off the edge of a mountain while trekking is surprisingly common. While it may result in an instant death, to the person who looses their footing it can be a terrifying few slo-mo seconds – not knowing what will happen at the end. Slip a few feet or a few hundred? Live or die? I wonder whether the aunt in question was looking forward to another 10 or even 20 active years of doing the things she enjoyed. If you can squeeze another chapter out of life then surely dying at 82 is just as tragic as dying at 22. The next day I read in the local paper about how a 92 year-old man had recently married an 81 year-old woman. The photo of the recently weds was touching – clearly they saw a future together. When is the right time to go? Just as we have no control over when we are born we don’t know when we will die. The debate over whether people who have life threatening illnesses should have the right to decide they want to die through assisted suicide rumbles on. Last week it was voted out by the UK government. There are too many arguments stacked against helping people who want to die knowing they have a terminal illness compared with those for helping them. Some vulnerable people will feel pressurized by the state or their family to die earlier than they might want to – being a burden on society. Others lose their mental faculties to no longer be in a fit state to make such a decision. Life is precious no matter what. And so on. The moral high ground remains with the living. My dad died of Alzheimers a couple of years ago. It was a long and painful time for him, especially in the later stages. In the early stages he tried to talk to the family about wanting to die early through assisted suicide. The family would not hear of it. I was more sympathetic, knowing my dad and observing the devastating deterioration in the quality of his life. Up until his mid 70s he was as fit as a fiddle climbing mountains, like Snowdon, when ever he could. For a long time, as the illness took away his faculties, his personality and his raise d’etre, he would cry repeatedly, when we visited him, that he wanted to die. It took many more years before his body finally gave up. The last few days watching him literally starve to death after he had had multiple seizures and was no longer conscious was harrowing. I have enormous respect for people who have dementia or terminal cancer, who have made the brave and measured decision to travel to Switzerland with their partners or family, to die in dignity rather than go through such an ordeal. Meanwhile, on the news today, research reported in the Lancet mentioned how placing notices for how to get help from the Samaritans at the end of railway platforms or putting thorn bushes at the edge of well known hotspots can act as highly effective preventative barriers – often just enough to make suicidal people stop and reconsider. In that moment they can come to their senses and seek help, often enough to move them from the brink. 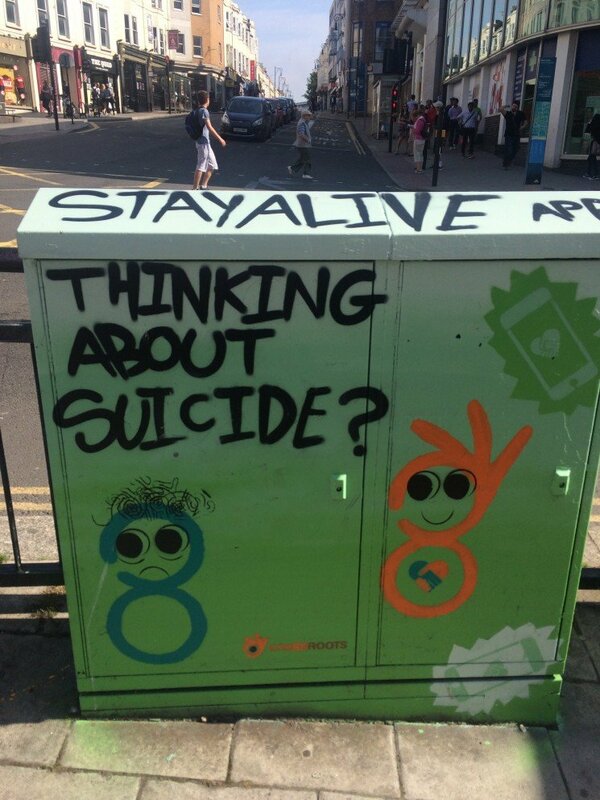 For example, in one study in the UK and Hong Kong, it was found that the number of people taking their own life dropped by over 50% after these kinds of simple interventions were introduced. In another study it was over 90%. Clearly, the motives for attempted suicide are different from assisted suicide. The period of a suicidal crisis, where a person becomes obsessed by the need to die for whatever reasons, can be broken. A bush, a safety net or a stranger simply asking someone if they are OK can break the trance. It is a cry for help and when they have to stop and think it can be enough for them to reconsider.